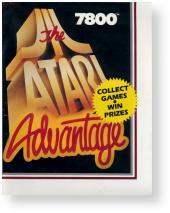 Atari produced two different Atari Advantage catalogs, one for the 2600 and another for the 7800. This catalog features all the 7800 games that were available (or coming soon) when the catalog was published. Nearly 30 7800 games are shown, with 13 of those titles designated as "Coming Soon". All the games depicted in this catalog would see the light of day, although Deluxe Asteroids would be released simply as Asteroids (perhaps to avoid confusion with the earlier Atari coin-op Asteroids Deluxe?) This catalog featured a contest with the grand prize being a 7-day trip to California including a day at Atari Headquarters to "see video games designed." But in order to become eligible to enter an essay writing contest to win the trip you first had to purchase 25 game cartridges. In addition, purchasing games could net you free Atari T-shirts, game cartridges, and discounts on Atari hardware. Records Found: 27 Click on a column header to sort by that column. Click again to reverse sort order.